Tableau outstanding and remarkable features and services are what make it the perfect tool for improving profitability and simplifies your works. Sports teams have data everywhere: player statistics, media contracts, ticket and merchandise sales, and licensing deals. Analysis tools in the sports industry need to be especially nimble. 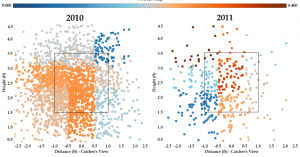 Industry leaders are already using Tableau for their sports management analytics. Professional sports teams have begun to use analytics throughout their organizations, from measuring on-field performance to marketing. Sports fans have begun to leverage analytics through all forms of their sports consumption, from fantasy roster analysis to buying tickets. Several use-cases are explored below, from both the fan-facing and team-facing sides of the sports management analytics industry. Quickly visualize and and easily analyze your data are the key to business value acquirement. Contact us to find out more how Tableau can help you to achieve success for your organization. Evaluate scouting reports and compare player traits visually Any successful sports franchise needs to be good at identifying valuable players. As sports analytics diversify, the difficulty stems from not a dearth but an overabundance of data. Tableau offers a solution: Shrink your performance review time by transforming large volumes of data into easily understood and constantly updated visualizations. Tableau’s advanced interactive features enable the creation of dashboards that are designed for exploration and customization. For example, this dashboard shows the players at the yearly NFL Combine for top college football prospects that best combine speed and size. It is sortable based on position and year, and provides a scatter plot and a ranking of all the combine attendees in the particular metric you select. 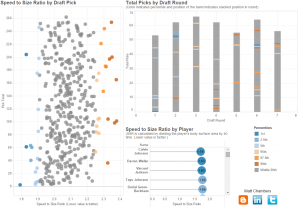 For an even deeper understanding, hover over the data points on the scatter plot or bar charts to see all the relevant statistics for that player. Thank you to Matt Chambers for the visualization. Dynamically track assets across an organization Professional sports teams are large organizations with diverse asset classes, one of the most important of which is their players. Tableau enables sports franchises to quickly and powerfully track the development of their players. Tableau connects in real time to databases and provides a constantly updated stream of information that is concisely illustrated in digestible interactive dashboards. In the above example, Sarah Stone of the Texas Rangers charts how often and for how long Rangers players went to the Disabled List. This is an example of a Tableau visualization that is used in professional sports team’s front offices. 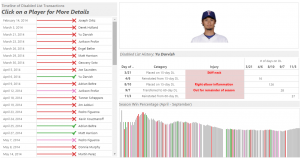 Interact with the dashboard and see just how many of the Texas's star players were felled with injuries in the 2014 season. Special thanks to Sarah Stone for developing the dashboard. Create optimal in-game strategies based off of past results. Sports management involves making all kinds of decisions from in-game strategic decisions to setting ticket prices. Tableau lets you combine live data with historical data to offer critical insight. 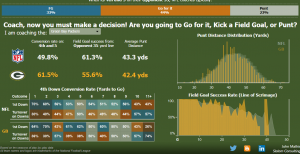 This dashboard offers insight into one of the most critical decisions a coach can make: whether to go for it on a fourth down in a football game. This dashboard shows how visual analysis can inform difficult decisions. You can change the parameter to specify quarter, or yards to go, or position on the field. You can drill down by choosing which particular team you want to control, sifting the underlying historical data to analyze exactly what situation you are interested in evaluating. Thanks to Tableau Iron Viz Champion John Mathis for developing dashboard. Rapidly evaluate personnel across performance metrics. Accurately evaluating players is vital to any sports franchise’s success. Tableau provides a software platform for powerful player evaluation. Tableau lets you construct robust statistical dashboards without requiring development skills, transforming any member of the front office into a data analyst. Tableau’s dashboards are interactive, allowing for powerful immersion into the data. Tableau’s dashboards are also easy to interact with and easy to comprehend, allowing for easy dissemination across an organization. This is a performance evaluation dashboard for a particular athlete. Highlight the data points to see a tooltip of relative success in 2010 and 2011. Drill down to analyze other metrics in the tabs along the top of the dashboard. Thanks to Bill Petti for developing this dashboard. Leverage organizational data to identify metrics of success Sports franchises are unique organizations in that there can often be multiple success metrics for performance evaluation. On field success can be correlated with financial failure, and vice versa. Franchises need to have clear organizational goals to facilitate positive growth. Tableau offers solutions for generating clear, quick, performance reports. Tableau can synthesize multiple data streams from different data sources and aggregate information in powerful, easy to understand dashboards. Tableau facilitates the foundation of franchise-wide strategy decisions on sound data analysis.